but none of the above sounds like learning the way we hint at in blog posts, those posts that breathe the phrase "they get it". At least to me. Let me share where this comes from. I remember when I was at the teacher's training college. Aldo Blanco, my linguistics teacher was mystified by Noam Chomsky. He knew his explanations were hard to bear; he admitted his teaching skills were not the best. All he was after was not our perfect understanding of the subject, but our learning to think. I remember him looking into my eyes and asking me if I felt something was wrong with the trail of thought he was exposing. I nodded without having a conscious clue at why the argument was dissonant. He agreed. He went on to say how newer theories had already found other ways. He knew the class time was not enough to go full circle in discoveries that had taken linguists years, yet he valued our intuition, our hinting at it. The oral final exam of the subject Linguistics was super. I had a 'time-out' to think about a question and then go talk about it in front of the examination board. His questions were of the type "How did you get to that conclusion?" The tension of the moment was I knew all the while my conclusion path was incomplete, perhaps utterly wrong. He evaluated my process. He never flaunted the right answer. Sometimes us students got puzzled. One of our comments to the topic of the class would set him thinking aloud -clearly going away from the original class plan. It was hard to follow his mind, his smile at getting somewhere was a poser to us. Yet he talked as if we could follow, as if we were not his students, but peer researchers in the localist theory of case. Other times he fell silent for long minutes, smoking, reflecting, right there in our presence. Open-ended lessons. Together equals same place, same time. The moment, the silence, the image of it are a footprint in my mind. If the learning experience is just for the student, if it is unidirectional, is it learning? I do not have answers. I have implications. I am concerned with a traditional teacher's love of control and careful lesson planning. I am worried about a overly loyal treatment of the curriculum at hand. I wonder if a total prediction of the road or the outcomes is a good learning path planning. Are you planning room to learn something yourselves when you design your class? How do you do that? Can you be surprised or blown away by a student's reflection or question? And if none of this happens, what did they actually learn? We all have learning illusions underpinning our practice. We generally are more or less aware of them or how they drive us to prove them right. As much as we tend to impulsively agree that we all move in the direction of fostering life-long, autonomous learners, we are confident our teaching role is still necessary. That role means something different for each of us. I think we owe our colleagues and students some transparency. Before approaching the teacher's role, I think we need a clarification of lexical items. My belief, my bias, is that learning happens in a meeting of minds with unequal knowledge backgrounds. A togetherness of sorts with a classroom or online scenario (see number 3) for a place and a time that need not be strictly the same, but more right-in-time for learning. The conversation is the medium that enables learning. It involves a negotiation and some passing of meaning among the participants. All of the people involved are transformed by it. This is where it differs from a monologue. Mind you, you can still learn from or with it. To get together, to make community, we have to be able to generate and be part of some constant knowledge flow. A river of news, a network. To stay together, we have to keep learning together. What? Right. I'm discussing learning together and I forget the blog, and the wiki, and Twitter. How come? Well, to me, if we talk about genuine learning, those are just technical details. Or distractors perhaps. 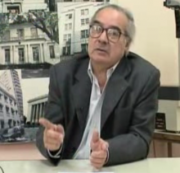 Looking for links for my teacher, I just learnt that Professor Aldo Blanco passed away last October 2009. Let this post be a humble open tribute to one of those teachers who hard-wired my brain into reflection. A person who valued thinking over method. A teacher who would let us see the interstices between the marriage foreign language teachers sometimes force between general and applied linguistics. I also pay a private tribute. I keep all of his legendary grammar class notes. Everyone who studied with him in the nineties remembers those heavy paper notes photocopied from a an original made in a typewriter -full of his tiny handwritten comments. No one ever got the complete works, we had to exchange the missing pages with his previous students. Truly unforgettable.